Hugh Farmer: While researching Tai Po Kau KCR station, which no longer exists, I came across this film. It’s great fun but does it show TPK station and was it part of a longer film? Any ideas anyone? Click here to watch the mini drama. This article was first published on 8th February 2014. 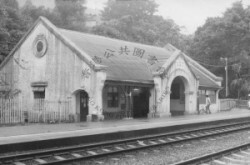 For more information about the defunct Tai Po Kau railway station have a look at this posted by Phil on his impressive blog. This includes a Bruce Lee connection!